Are you tired of answering the question, "How did my child earn his/her participation grade?" 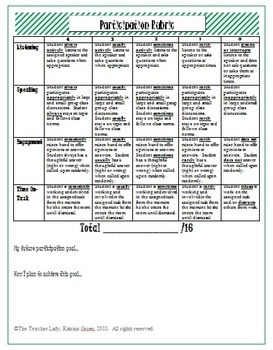 This file is a rubric that breaks down a student's participation into speaking, listening, engagement, and time on task. 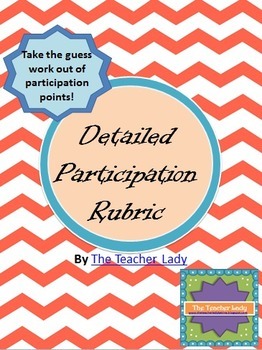 Whether you evaluate participation or have students self-evaluate, this rubric will make it easy! This rubric also includes a spot for students to make a goal for further participation during the year. Thanks for choosing The Teacher Lady!